Rita Riewerts, the suncatcher from Forks of the Salmon, published in the Two Rivers Tribune. Winnett Vineyards: A Winning Combination, published in Two Rivers Tribune, some time in Sep 2010. Serpentine – the snaky life-bringing mineral, published in Two Rivers Tribune, some time in Sep 2010. Let’s leave the Plastic Age behind us! Let’s leave the Plastic Age behind us!, published in Two Rivers Tribune, Wed 19 May 2010. Rivers – Arteries of our Earth, published in Two Rivers Tribune, Wed 23 Mar 2010. 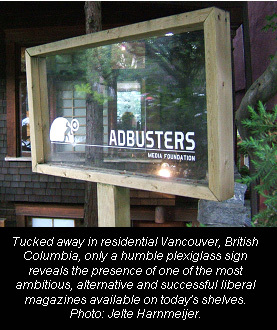 AdBusters has rapidly become emblematic of the liberal movement. But who are the people behind it? Do they ride bicycles to work and eat only raw vegetables? And are they winning? I spent most of my life in Southern Africa. Like a grain of Kalahari sand carried in the Okavango River that suddenly finds itself – quite unexpectedly – in the fertile Okavango Delta, the river of life somehow carried me to UW’s Astrobiology Program where I found myself surrounded not by Gemsbok and Fish Eagles but rather by some of the best astrobiological thinkers (and, after three years of national conferences, I confidently count our graduate students amongst these) on the planet. Memories of my Third World childhood frequently stir me to justify my luxurious existence as a researcher into Earth’s deep past. It is my contention that, within an age that has been aptly coined the ‘anthropocene’, the allocation of resources towards the pursuit of NASA-scale scientific goals requires critical evaluation. The resource-base with which our planet is endowed is limited, a fact that should now be becoming increasingly clear to even the most ardent of industrialists. Indeed, it is arguably exactly the scientists -even more than many of their planetary co-inhabitants- who should be expected to be particularly self-critical in this context, working as they commonly do at the interface between humanity and the natural world. Do we go to Mars, or heed the near-apocalyptical outcries of many environmentalists and invest instead in monitoring our planet’s bio-, geo- and atmosphere through Earth-observation satellite technology? And then there’s the fact that someone needs to feed scientists such as myself. In return, we can rarely offer more than a vague commitment to the taxpaying public to increase the information content of the universe, largely through the publication of increasingly specialized articles in increasingly unreadable scientific journals. Peoples of all cultures and times have derived Meaning from pondering the questions that we astrobiologists get paid to answer. Meaning, I contend, is largely a matter of timescale selection. We humans are evolutionarily conditioned to contextualize our experiences within the meagre timescale of a couple of generations at most. In much of the Western world, the dominant trend towards forever increasing individualism further shrinks this ‘window of reality’ to the pitiful lifespan of our own consciousness. 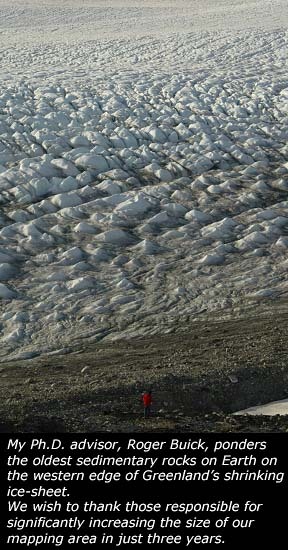 Astrobiology certainly provides some refreshing temporal and spatial distance from this. What is to become of Meaning in the face of an expanding infernal Sun overrunning Earth’s orbit about 4 billion years from now? And is Meaning itself somehow slated to escape the ultimate universe-scale heat-death necessitated by the Second Law of Thermodynamics? With these upcoming events in mind, can a human-catalysed mass-extinction objectively be regarded as A Big Deal? With these thoughts in mind, I return to the microscope on my desk. Looking through the eyepieces, the dark mass of 3.8-billion year old graphitized organic matter still sits quietly, unmoved, waiting. 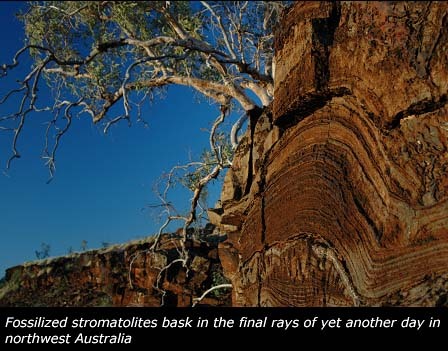 To find our more about our research into the oldest life on Earth, visit our website. The announcement of the U.S. President’s Emergency Plan for AIDS Relief (PEPFAR) was met with both eagerness and skepticism when it was first announced by President Bush during the 2003 State of the Union address. The plan promised, for the first time, a commitment to attack the deadly AIDS scourge with more than just measures of prevention. Explicitly, PEPFAR promised $15 billion over five years to provide care and treatment for HIV/AIDS in fifteen severely affected countries. Activists, medical professionals, and the HIV affected expressed concern about what was left unsaid, however. As plans have solidified, at least on the front lines of the epidemic, skepticism has now largely overtaken much of the initial agerness. Take the 15th International AIDS Conference held in Bangkok, for example. Randall Tobias, still fresh in the newly created shoes of ‘U.S. Global AIDS Coordinator’, faced a furious crowd. The view from the speaker’s platform was largely obscured by a foamy sea of white “HE’S LYING” placards. (Check out his speech and subsequent interview on www.kaisernetwork.org). Those close to the epidemic are most critical of the plan’s allegiance to industry interests, its threat to comparable multilateral initiatives, and its insistence on forcing a controversial moral agenda. The skepticism of those affected by the disease is not surprising. The Pharmaceutical Research and Manufacterers of America (PhRMA) is the most powerful lobbying group in the U.S., exerting significant influence over the U.S. trade and domestic policy agenda. 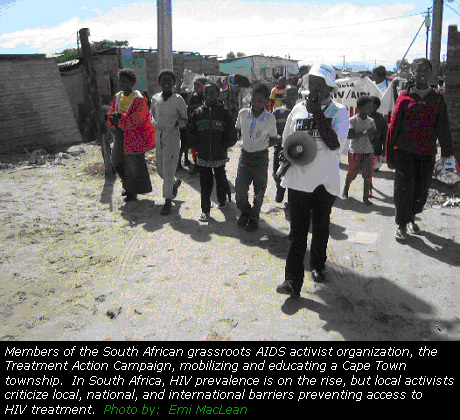 There have been few attempts to hide Big Pharma influence within PEPFAR. Tobias himself, who was sworn in with the rank of Ambassador in October 2003, was voted “Pharmaceutical Industry CEO of the Year” by the Wall Street Journal in 1995 when he was Chairman, President, and CEO of the pharmaceutical giant Eli Lilly. One of the most consistent criticisms of PEPFAR is its reliance on patented drugs rather than less expensive generic antiretroviral drugs (ARVs), already proven to be effective and in use in parts of the developing world, including India and Brazil. Health Action International (HAI, www.haiweb.org) founder Wilbert Bannenberg estimates that the branded products required by PEPFAR cost, on average, thrice that of equally good generic alternatives. EPN’s criticism goes deeper than just inefficiency, however. For one, having different brands of the same drugs leads to wasteful complications for already overburdened healthcare systems. Of further concern is the fate of small domestic industries, since the insistence on FDA-approved drugs will threaten the existence of tried-and-tested drug supply chains. (Many African countries currently locally produce low-cost drugs against opportunistic infections associated with HIV/AIDS). In the long-run, the eventual suspension of PEPFAR may leave a veritable chasm in its wake. 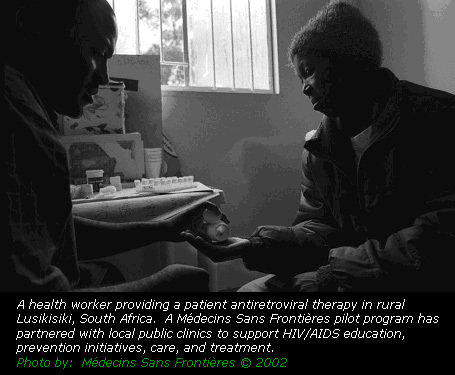 Over the last two decades, Africa has of course not stood limply by in the face of the AIDS pandemic. Unfortunately, PEPFAR is staunchly unilateral, to the extent that it will likely undermine other international and local efforts. Its implementation promotes the extensive use of U.S. skills, personnel and institutions to the detriment of readily available local expertise, often with a greater understanding of relevant issues in their local contexts. “There must be lessons to be learnt locally rather than exporting methods from developed countries,” says Associate Professor Billy Futter in the Faculty of Pharmacy at Rhodes University in South Africa. Liberal advocacy groups came out forcefully against President Bush’s recent surprise nomination of Paul Wolfowitz as president of the World Bank. Many fear that Mr. Wolfowitz will pursue a policy tainted with U.S. economic and strategic interests, shifting the Bank’s -already contentious- focus away from its’ stated goal to “fight poverty and improve the living standards of people in the developing world”. With Wolfowitz explicitly laying claim to a policy of “poverty reduction with special focus on Africa”, the Spark set out to uncover African perspectives on the new president of the World Bank. Amidst the settling dust, the World Bank rose from the still smoking remains of World War II as part of the Bretton Woods Agreement. In much the same breath, the International Monetary Fund (IMF) and the General Agreement on Tariffs and Trade (GATT, now the World Trade Organization or WTO) made their appearance in the global arena. Despite claims to the contrary, the World Bank runs much like a private corporation. Member countries adopt the effective roles of shareholders, with the number of shares -and votes- based roughly on the size of the country’s economy. Consequently, the U.S. is by far the largest single shareholder, with 16.41 percent of votes, followed by Japan (7.87 percent), Germany (4.49 percent), Britain (4.31 percent), and France (4.31 percent). As a result of this voting structure, the Bank’s president is traditionally a national of the U.S. Elected for a five-year renewable term, the president chairs meetings of the Board of Directors and is responsible for overall management of the Bank. Historically, the U.S. Treasury Department, which monitors the Bank’s daily operations and instructs the U.S. executive director how to vote on loans and other issues, was responsible for who occupied the Bank’s driving seat. However, as pointed out by Professor Victor LeVine, a political scientist at the Washington University in St. Louis, Wolfowitz’s nomination was unique in having been imposed by the White House, whilst “the U.S. Treasury was relegated to the cheering section”. A worried Chofamba Sithole, an outspoken Zimbabwean journalist, told the Spark how Wolfowitz’s background is unmistakably interwoven with U.S. national defense and security. Back in March 2001, Wolfowitz began his third tour at the Defense Department as the 28th Deputy Secretary of Defense. With over thirty years of public service under his belt, mostly in government service under six different Presidents, there were few who doubted his suitability for the post in the Pentagon or White House. Since September 11th, Wolfowitz has been instrumental in planning the so-called ‘war on terrorism’, including military operations in Afghanistan and Iraq. He has also played an active role in diplomacy, through a plethora of speeches before international audiences. During his first Pentagon tour as Deputy Assistant Secretary of Defense for Regional Programs from 1977-1980, Wolfowitz led the first major assessment of U.S. strategic interests in the Persian Gulf, a study which spawned the so- called ‘United States Central Command’. Wolfowitz also initiated the ‘Maritime Pre-positioning Program’, a plan that positioned heavy weapons and ammunition aboard ships in the Persian Gulf region. This plan would form the backbone of the initial U.S. response during Operation Desert Shield 12 years later. Indeed, it was none other than Wolfowitz who succeeded in razing over $50 billion in allied financial support for the Gulf War. So what do Africans think? Many have also questioned Wolfowitz’ credentials, pointing out that he has no experience in banking or finance, and has never worked, studied or written in the field of international development. 7,200 candidates, organized into 83 electoral blocs. 75 seperate attacks and 44 killings by the Iraqi Resistance. That’s a lot of democracy, eh? Invasions and corporate interest aside, what were the results of the Iraqi election? On Sunday, January 30th 2005, Iraq held its first elections since the fall of Saddam Houssein in April 2003. The event was lauded as a major success in mainstream Western media. The election fell ten days after President George W. Bush’s inaugural speech in which he announced, using the familiar neo-conservative buzzwords, that America’s future depends on the success of democracy overseas, and called the election a historic event. Bush added, in light of election-day violence that claimed the lives of over 40 people, that some Iraqis may die while exercising their rights as citizens. Three concurrent elections took place. The major election was for the 275 member Iraqi National Assembly, the legislative body responsible for drafting Iraq’s permanent constitution and the eventual election of Iraq’s president and prime minister. Elections were also held for local Governorate Councils, as well as for the Kurdish National Assembly in Kurdistan. About 58% of registered voters turned out in Iraq’s late January elections. However, the turnout was far from homogenous amongst Iraq’s diverse ethnic and religious groups. In particular, there was a very low voter turnout amongst Iraq’s Sunni Moslems, with most estimates as low as 9%, in contrast to turnouts of around 70% for other major groups. This is hardly surprising in view of Sunni clerics call for an election boycott in protest at U.S.-led assaults on Sunni-dominated cities. The high voter turnout among Shiites and Kurds is itself also not lacking in controversy. Voters in Shiite areas of Baghdad, for example, faced threats from government officials of withholding food rations unless they signed voter registration cards. Others complained that US troops in cities near Baghdad tried to coerce people into voting. Elsewhere, in Kurdish areas to the North, voters have complained of voting irregularities, such as early closures of polling stations, as well as the peculiar absence of certain Kurdish political parties on the ballots. What are the implications for Iraq’s future government? The fair & balanced people at FOX-NEWS will probably tell you that Iraq consists of lots of Shiites, some Sunnis and some Kurds. 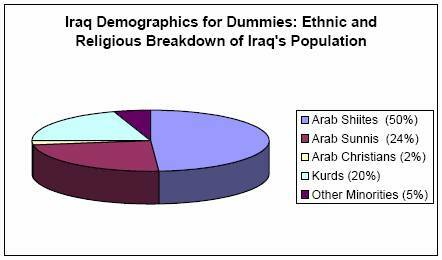 We at Ruckus will tell you that, in fact, Iraq ethnically comprises about 75% Arab and 20% Kurdish peoples. (Minorities, such as Assyrians and Turkomans, make up the remaining 5%.) Religiously, Shiite and Sunni Moslems make up 65% and 32% respectively, with the remaining 3% made up largely peoples of Christian faith. The vast majority of Iraqi Kurds adhere to Sunni Islam. Iraq’s Sunni Moslems are strongly split along the Kurd-Arab ethnic division, however. In Iraq’s three predominantly Kurdish provinces in the north, the Kurdish nationalist parties – consisting mainly of the Kurdistan Democratic Party (KDP) and the Patriotic Union of Kurdistan (PUK) – have formed a joint electoral bloc called the Kurdistan Alliance. They have also cunningly amalgamated all nine other Kurdish political factions: the Assyrian National Party, the Chaldean Democratic Union Party, the Democratic House of the Two Rivers Party, the Democratic National Union of Kurdistan, the Kurdistan Democratic Socialist Party, the Kurdish Islamic Union, the Kurdistan Movement of the Peasants and Oppressed, the Kurdistan Toilers Party (Zahmatkeshan) and even the Kurdistan Communist Party. The Alliance, in other words, campaigned for votes almost exclusively among Kurds, with the main objective of consolidating the region around Kirkuk into the Kurdish sphere and thereby limit the influence of a central Iraqi government. 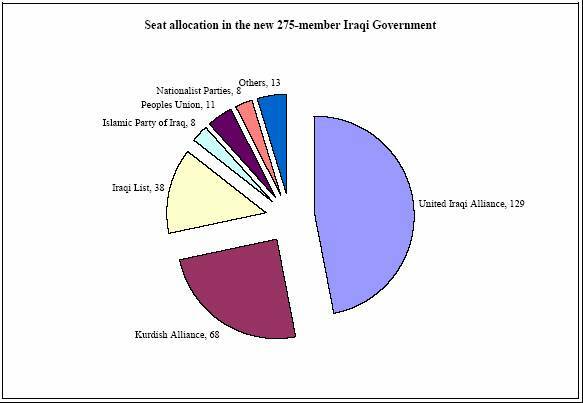 As a result, they stand to control 26% of Iraq’s new Assembly. Iraqis voted largely for parties and leaders of their own ethnicity and religion, giving Shiite parties is massive advantage. Not all Shiites voted for non-secular parties, of course. Yet, in the predominantly Shiite precincts in the south, about four-fifths of votes went towards the religious Shiite United Iraqi Alliance (UIA), giving rise to a final vote for the UIA of 48%. The UIA’s main components are the sectarian Shiite fundamentalist parties: the pro-Iranian Supreme Council for the Islamic Revolution in Iraq (SCIRI) and the Da’wa Party. Other incorporated bodies include the Badr Organisation, the Central Grouping Party, the Islamic Fayli Grouping in Iraq, Al-Fadilah Islamic Party, the First Democratic National Party, the Islamic Fayli Grouping in Iraq, Iraq’s Future Grouping, the Hezbollah Movement in Iraq, the Justice and Equality Grouping, the Iraqi National Congress, the Islamic al-Dawah Party-Iraq Organisation, the Islamic Master of the Martyrs Movement, the Islamic Task Organisation, and the Islamic Union for Iraqi Turkomans. The current Prime Minister Ayad Allawi’s more secular U.S.-funded Shiite coalition, the Iraqi National Accord (INA), heads a party known as the Iraqi List. The Iraqi List also represents the Council of Iraq’s Notables, the Iraqi Democrats Movement, the Democratic National Awakening Party, the Loyalty to Iraq Grouping and the Iraqi Independents Association. The Iraqi List won a dismal 14% of votes. It is undeniably the Sunni Arabs who stand to lose most from the current state of Iraqi politics. Anticipating this, an influencial Sunni religious body known as the Association of Muslim Scholars had called for a boycott of the elections. The Association has taken a leading role in representing Sunni Iraqis in the absence of an organized Sunni political movement. The Sunni political vacuum results largely from the banning of former Baath Party officials from the elections. Predictably, then, things did not bode well for the Iraqi Islamic Party, the main Sunni party in Iraq. It was lucky to get eight seats in the Assembly. Some other noteworthy parties and individuals that boycotted the elections were the National Front for the Unity of Iraq, Shaykh Muhammad Jawwad al-Khalisi (Secretary-General of the INCC), Dr. Wamid Jamal Nazmi, the Arab Nationalist Trend Movement, Imam al-Khalisi University, the Democratic Reform Party, the United National Front, the Iraqi Turkoman Front, the Iraqi Christian Democratic Party, the Islamic Bloc in Iraq, the Office of Ayatollah Ahmad al-Husayni al-Baghdadi, the Office of Ayatollah Qasim al-Tai, the Union of Iraqi Jurists, the Higher Committee for Human Rights, and the Iraqi Women’s Association. Of the roughly 280,000 voters registered outside of the country (roughly 23% of all exiled Iraqis), about 93% voted in the election. The Iraq Out of Country Voting Program (http://www.iraqocv.org) estimates that about 36% of absentee votes went to the United Iraqi Alliance, about 29.6% to the Kurdish Alliance, with around 9% going to the Iraqi List, 4.41% to the Communist Peoples Union, and the rest scattered among the remaining 7,000 or so parties. Even though Interim Prime Minister Allawi has been effectively marginalized by his party’s low turnout, things may still turn out in favor of the United States. SCIRI, the Iranian-backed front-runner within UIA is currently headed by Interim Iraqi Finance Minister Adel Abd al-Mahdi. Al-Mahdi has been a vocal supporter of the privatization of Iraq’s state-owned enterprises, and assured Washington back in December 2004 that he would enact oil-laws that would be “promising to American investors.” The UIA also includes the Iraqi National Congress of one-time U.S. favorite Ahmed Chalabi, whose future in the new Iraqi government will hinge on the ability of the UIA to form a successful coalition. Questions have to be raised about the election process. Iraqi voters were presented with lists of thousands of political parties to choose from, about which most had little to no knowledge. The country itself was put under lock-down, with extended curfews and closed borders, and no international observers were allowed into the country to monitor the election. What’s more, the election was held under the penumbra of a foreign occupation, a process declared illegitimate by the Hague Convention of 1907, in which no foreign power may make permanent changes to the government of an occupied territory. It is interesting, therefore, that when asked why they came out to vote, most Iraqis (Shiites and Kurds included) answered overwhelmingly that they were voting for the end of the occupation and a return of Iraqi national sovereignty. This hope seems unlikely to be answered. President Bush has given no timeline for the withdrawal of troops from Iraq, and plans are already underway for the construction of four permanent U.S. military bases in the country. Perhaps most ironic is the fact that, despite all the anti-occupation sentiments among Iraqi voters, the most successful parties thus far are led by people like Abdel Mahdi, a person who announced at a recent press conference that he would open up Iraqi national Oil to foreign investors, (effectively guaranteeing the US a monopoly on Iraqi oil) and Ayad Allawi, the CIA backed prime minister of the occupation government. The new Iraqi government will have a difficult balancing act on its hands. On the one hand, the new government will have to deal with the United States, who is poised to remain in Iraq indefinitely. On the other hand, the government will face challenges on the domestic front. Sunni Arabs will be grossly underrepresented in the new government. Complicating issues further is the problem of Iran. The leading Shiite cleric, Iranian born Ayatollah al-Sistani,who at one point was at the center of the insurgency against American troops, is one of SCIR’s biggest supporters. A New York Times article from 1967 on the elections in South Vietnam began circulating over the Internet shortly after the election. It reported that amidst Vietcong terrorism, 83% of South Vietnam’s roughly 6 million voters voted in the election, which then president Johnson saw as an encouraging sign in the establishment of a legitimate democratic government in South Vietnam. While it may not be appropriate to make such an analogy at this early a stage, the eerie similarity between the media coverage of Iraq and Vietnam could be a sign of bad things to come. The U.S. did not pull out Vietnam until 8 years later, leaving 50,000 American soldiers and millions of Vietnamese civilians dead, as well as three countries in total ruin.